17th century English instruments and the small number of French viols made with "bent fronts” or tops. "book matched" wedges joined in the center and then roughed out with heavy gouges before being carefully carved to final their shape and thicknesses. was also in use in the construction of other instruments, like the backs of lutes. Was this method used because wood wide enough for two piece tops was more rare and expensive or were the makers of these instruments so skilled at the art of bending and joining pieces of wood that it was actually less work than fully carving from thick wedges? Or was it to economize, where 2 or even 3 bent fronts could be made from the same amount of wood needed for a single front, fully carved from 2 wedges? Whatever the reason, from an engineering point of view, this is a very significant feature. The wood fibers of the front follow through the complex, curving shapes, almost as if it had grown that way, making it stronger than a fully carved top which has areas of "run out" ...places where the fibers are are not parallel to the top, passing in one side and out the other, which weakens it and requires more thickness to achieve the same strength. The natural virtue of the design allows for making the tops thinner and therefore with less mass than the fully carved version, yet capable of making durable, resilient tops that are resonant and responsive ...and that ultimately have their own characteristic sound. A subtle thing, not better than a fully carved top, just different and appropriate for reproducing the sound of the time. all of those must be done well as muct the final "setup" of the viol, including the right string types and gauges chosen for the desired tone and response. But It was a design that must have been well appreciated, for whatever reason, as it was used by all the best known makers of it's day. 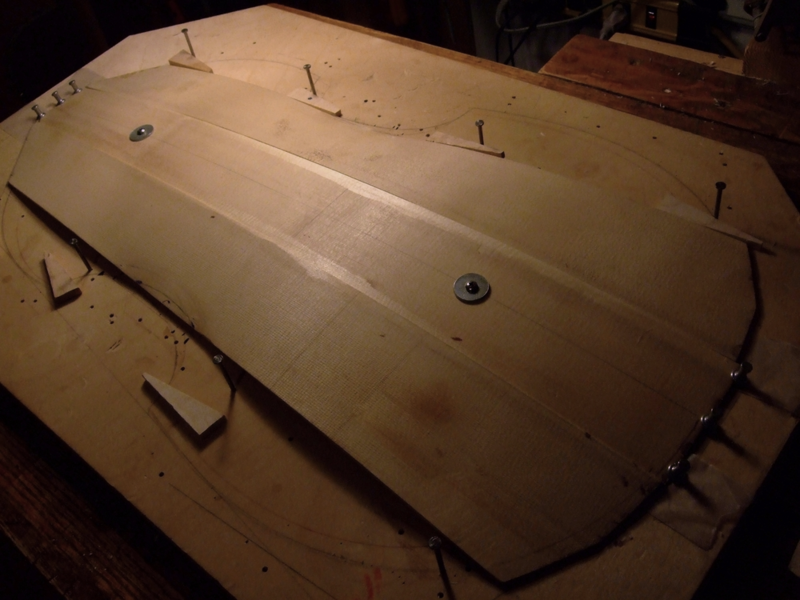 Once the top pieces are joined and the final shape and thickness achieved, strips of linen or vellum are glued on the underside of the top and inside the viol body to reinforce all the joints before finally closing the box.